Margaret, the matriarch of the wealthy Jamieson family, has always been as tight-fisted with the family money as she is with her affection. Sarah is the eldest child and although successful in her own right, her achievements are overshadowed by her younger brother. Sarah feels compelled to meet Margaret's every demand to earn her love. After a poverty-stricken childhood, Anita has claimed the social status she's worked so hard to achieve by marrying Cameron Jamieson. Although they have a comfortable life, she's never able to fully relax, fearing everything could change in a heartbeat. Ellie, the youngest, has lived a nomadic and - according to her siblings - a selfish life, leaving them to care for their ageing mother. For her, freedom means staying far away from the strings attached to her inheritance, but she needs to consider her young son's future as well. As their mother's health deteriorates, will long-held secrets and childhood rivalries smash this family into pieces? An addictive and page-turning story of the relationships between siblings and of deceit, betrayal and revenge. 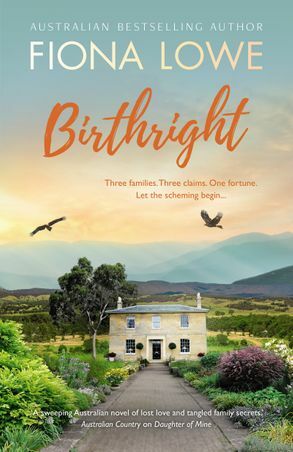 FIONA LOWE has been a midwife, a sexual health counsellor and a family support worker; an ideal career for an author who writes novels about family and relationships. She spent her early years in Papua New Guinea where, without television, reading was the entertainment and it set up a lifelong love of books. Although she often re-wrote the endings of books in her head, it was the birth of her first child that prompted her to write her first novel. A recipient of the prestigious USA RITA® award and the Australian RuBY award, Fiona writes books that are set in small country towns. They feature real people facing difficult choices and explore how family ties and relationships impact on their decisions. When she's not writing stories, she's a distracted wife, mother of two ‘ginger' sons, a volunteer in her community, guardian of eighty rose bushes, a slave to a cat, and is often found collapsed on the couch with wine. You can find her at her website, fionalowe.com, and on Facebook, Twitter and Goodreads.